I received compensation for this post from U.S. Cellular. The opinions within this post are of my own and I was not influenced in any way. Please do your own research before purchasing products or using services. Your opinions and results may differ. My husband and I are more vigilant than ever to manage our finances. We want to get out of debt and stay on budget. Doing so will allow us more money in the long run. There are several apps available for smartphones and tablets that assist in tracking expenses, checking accounts, and providing monetary overviews. Jason and I have been using a couple of these apps to help us visually see how we're doing and what changes we need to make for financial growth. As mobile banking and digital financial tools become even more popular, it’s easier than ever to use your smartphone to stay focused on finances. A 2013 survey by Quicken revealed that two out of three surveyed smartphone users say that being able to check their finances on the go gives them peace of mind; 23 percent said they wouldn’t make a major purchase if they couldn’t check finances from their phone. With one in three people losing sleep over money woes, it’s not surprising that many people are looking for tools and tips to better manage their money in 2014. Through a 2013 survey of U.S. Cellular customers, they’ve found that 23 percent of smartphone users utilize their phones to manage finances¹. They expect that number to grow in 2014. 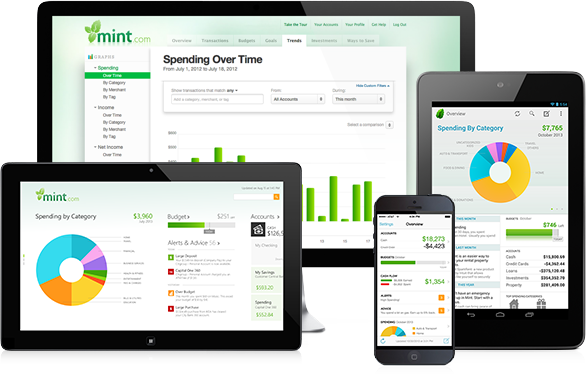 Manage your budget: The free Mint.com app and accompanying website keep a detailed account of your finances by connecting securely to your bank and credit card accounts and tracking the money you earn and spend. Avoid the time-consuming method of checking each account separately, and view spending patterns in an easy-to-read chart to save time and money. It will also alert you to upcoming bills, fees, low account balances and unusual activity. Utilize mobile banking: Many financial institutions offer mobile banking options, and by using an app from your bank or credit union, you can check your account balances on the go, view transaction details and make transfers. Check your statement or current balance from your phone before making a purchase to ensure you have available funds, or transfer funds for urgent needs. With access to the 4G LTE network, some apps allow you to deposit a check by uploading a photo using your phone’s camera, so you’ll have money without having to make a trip to the bank. Invest intelligently: Finance apps like Yahoo! Finance provide an overview on how the market is performing each day. Users can customize the experience to view the daily market summary, track tickers of interest, add and remove stocks from watch lists and view portfolios. Prepare for tax time: April 15 will be here before you know it. Apps like TaxCaster by TurboTax allow users to get a quick estimate of their 2013 federal tax refund on the go. The app uses the same calculator found in TurboTax and can use its estimates to recommend the best TurboTax product when it’s time to file. Track work expenses: For small businesses, expense reports can be frustrating for employees. However, apps like Expensify allow you to capture receipts, track mileage and create reports on the go. It takes the time, paper and headaches out of expense reporting and reimbursement and makes managing finances easier on the company and the employees. Visit a U.S. Cellular Device Workshop in your area to learn more about utilizing all that your device has to offer. Footnote: Between November 15 - December 2, 2013, 500 nationally representative online interviews were conducted among smartphone users in partnership with Martiz Research. What apps do you use on your smartphone or tablet to help manage your finances? I'm going to have to check out www.Mint.com - I think this would definitely help me stay more on top of my finances and give me a better view of my spending. Thanks for the review and the information.